“Thunder in summer”: The winners of Pritzker Award 2017. 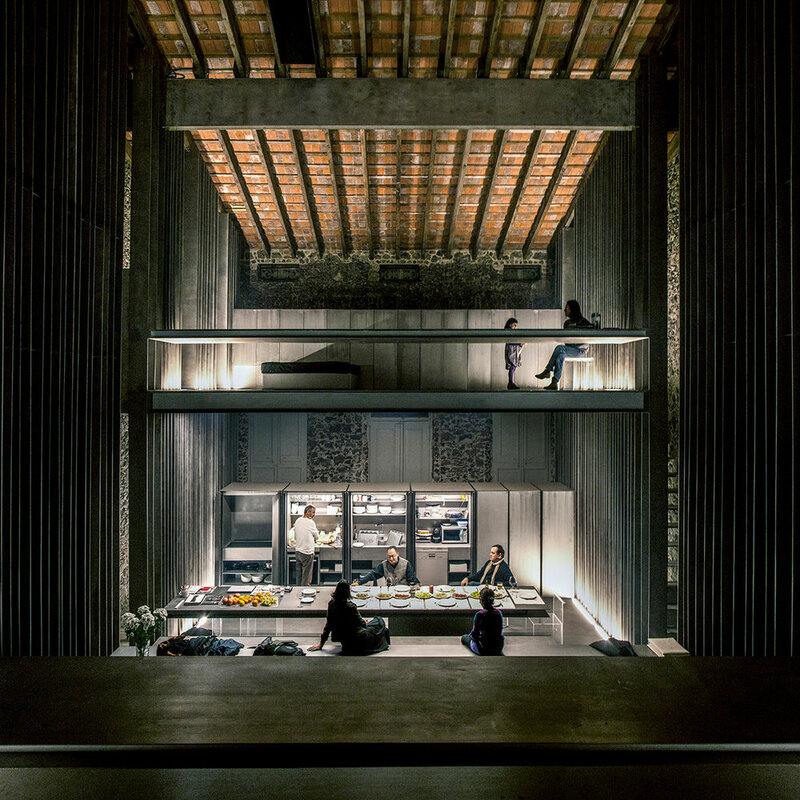 RCR Architects of Catalonia, Spain, received the award because they raise the universal category, the local values and maximize materials such as iron, recycled steel, plastic, wood, glass and the stone to bathe them to contemporaneity. *Art curator and architect in training. She was fellow architect in RCR Architects. Thread of water flows. The silhouette of the leaves of the trees is a landscape. Summer has begun. During this season Olot, acquires a particular color. Its architecture, its streets, its parks, become in light mirrors. The whole city body unfolds, and the urban geography changes rapidly. The sun moistened territory merges with the soft light and museographer, the same which has been conceived Espai Barberi. 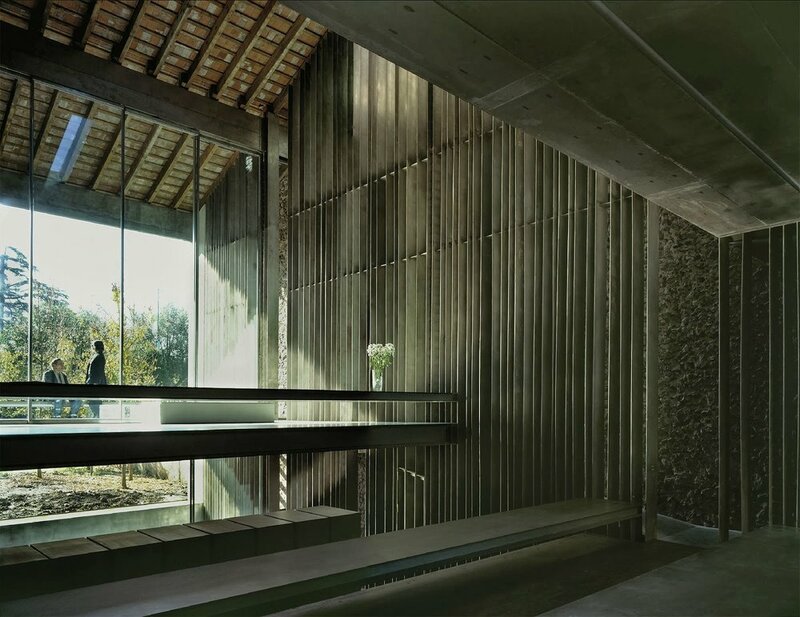 From there, he creates and produces RCR, studio conformed by the architects Rafael Aranda, Carme Piguem y Ramon Vilalta. His essence lies in combining the perfect equation: The architect, the art and the technique to create environments and emotional spaces, of bounded and accurate fragments in intimate communion with nature and the rational vigor of its authentic virtuosity. In the mid of a volcanic geography, a mineral carpet and a vast forest emerges, Olot, a small Spaniard municipality of the province of Girona, Catalonia. 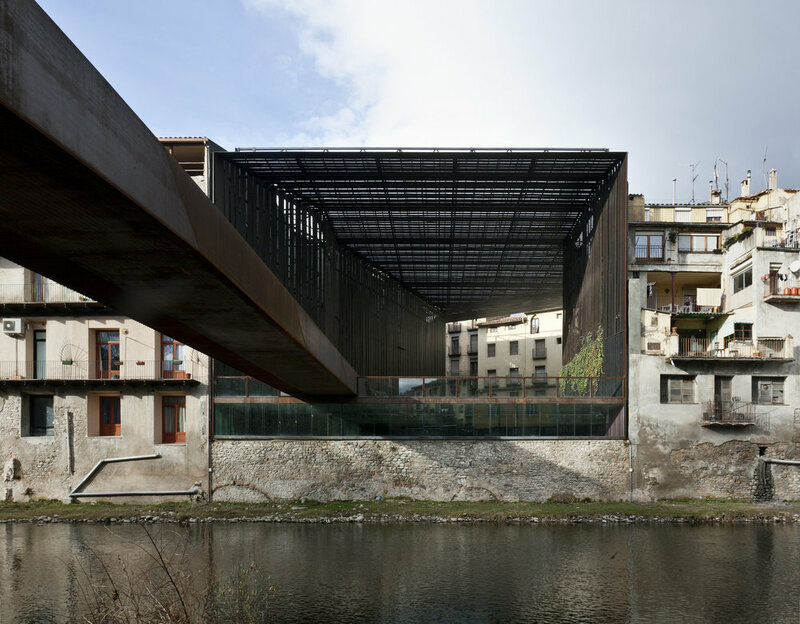 There is the Espai Barberi, clear example of the architecture that hosted by years an ancient foundry. The pure beauty of simple elements-walls battered by the smoke and rain and also drawn by the sun dilutes on the brick and the metal; windows ennobled by new material accents, thresholds opening streams to filter light as substance – corresponds to a methodical solidarity of the architecture of RCR architects. The RCR Lab A.- Laboratory of Architecture and Landscape, has as task to offer elements to develop a project that contemplates the design and construction of research instruments of architecture through discourse analysis, participant observation, semantic analysis based on images and concrete places with possibilities of future intervention because it includes the role of the architect as an observer that does not neglect detail and has a basic challenge in the research and reflexive creativity. RCR Lab A,- in co-organization with RCR Bunka Fundacio Privada and RCR architects shares each summer, since 2008, with fellows of different nationalities, questions for the space, environment, technical and aesthetic conditioners of their thought and their architectural practice; questions in which the architecture and landscape are active agents of interpretation. Then, accompanied by the dialogue and communicational processes with the architect Rafael, Carme, Ramon, the group of international tutors and the attentive listening of the lecturers, fellows start a work directed to the research for developing a project, to understand the work of RCR, becoming them landscape dwellers of Catalonia purposing approaches to new ideas and designs. 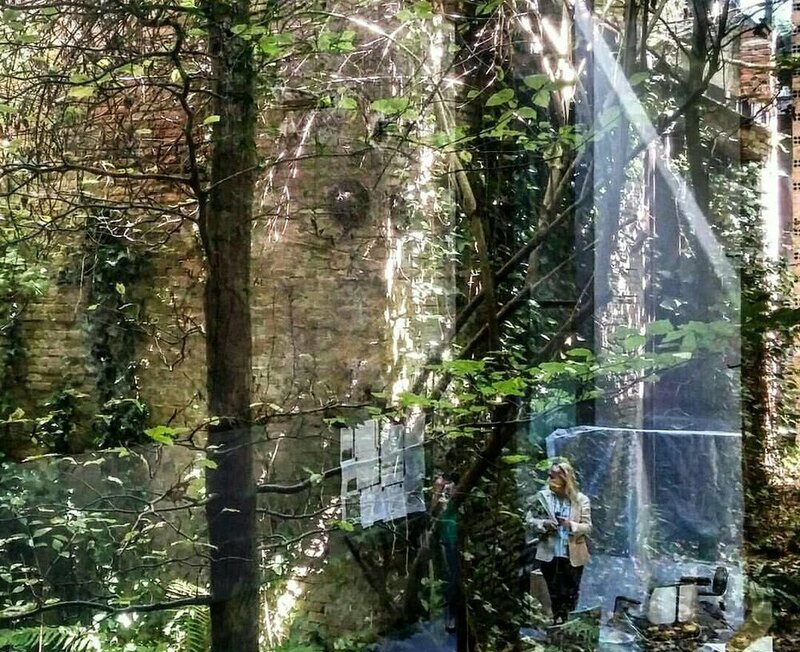 So, Lab A is a stay for observation, a course of action around architecture and landscape to use imagination as a bridge between aesthetic and ethics (as they are conceived by Kant and Hannah Arendt). An experience of the place that through the exploration of concepts perceptual and technical, configures the creative universe of culture and of ecology of information in the specificity of the architectural fact. Upon it, the spectator is convened to the question by discursive modalities of the architecture and the image, to cross the thresholds of aesthetic constructions of the silent diagrams that defines RCR. It is essentially, a lab thought around an architecture of an unrepeatable and unmatched vitality. 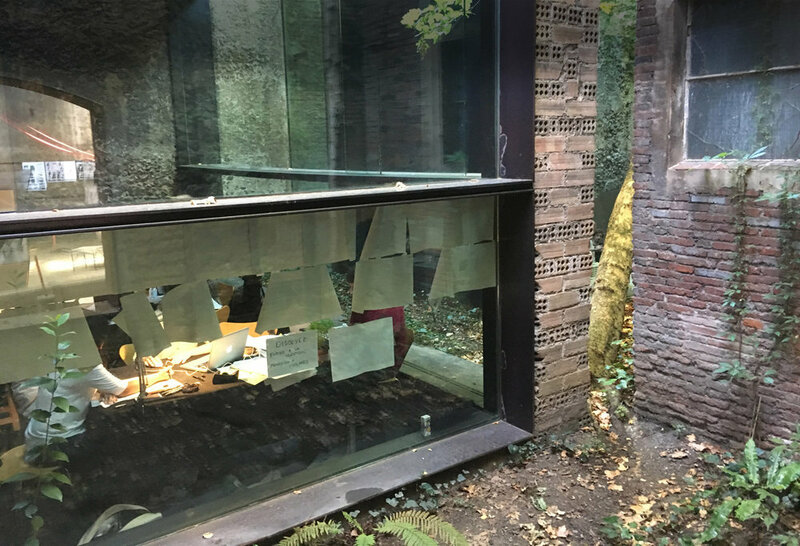 Espai Barberi is a cultural construction, a place of debate, an expository platform, a cell museum where it is installed the vacuum to make space and generate plans of architectonic, anthropologic and atmospheric readings. Vacuum planimetry of Espai Barberi are construed in discursive modalities of the images offered by RCR calligraphy in the interstices of light and shadow by which the air and the thickness of matter wander. One of the creative process that prints a unique stamp to RCR is the transit which permanently makes the world of art. Everything begin with drawings as ideograms that fit into the perfect 90 degrees grid.- expression of the domain of the architecture technique. From these pieces of art that are their drawings, RCR understands and knows how to read the place, to thus, design with fierce gesture that characterizes them. The fire of the quarries of iron shake even in the material textures which delineates the shapes of its items, and the promenade of its houses and the threads of stone as hung as sacred groves. Dignity of its architecture harmonizes with the nobility of landscapes silhouetted with precision. It is an architecture that includes an aesthetic of number, an aesthetic of light and an aesthetic of symbol. The inhabited demiurge. From the Dreams Pavillion, in Espai Barberi, place of learning and exhibition for fellows, nothing would have gone unnoticed. When crossing the umbral, nothing resists. Lucrecia Piedrahita O. Museologist and Art Critic of the University International of Art, Florence, Italy. Art curator – Fellow in LIPAC – University of Buenos Aires, Argentina. Specialist in Urban Journalism, Bolivarian Pontifical University (UPB) – Medellin. Specialist in Political Studies of Eafit University – Medellin. She is currently about to graduate as an Architect of the Faculty of Architecture from UPB, where she has received a Mention of Honor and Recognitions. She has been an Architect student and at the same time Professor of Theory and History of the Contemporary Architecture in the UPB Faculty. In 2017 she is part in the LAB – A of RCR Architects – Laboratory Barberi, Transdisciplinary Research which comprises the period 2017-2022. 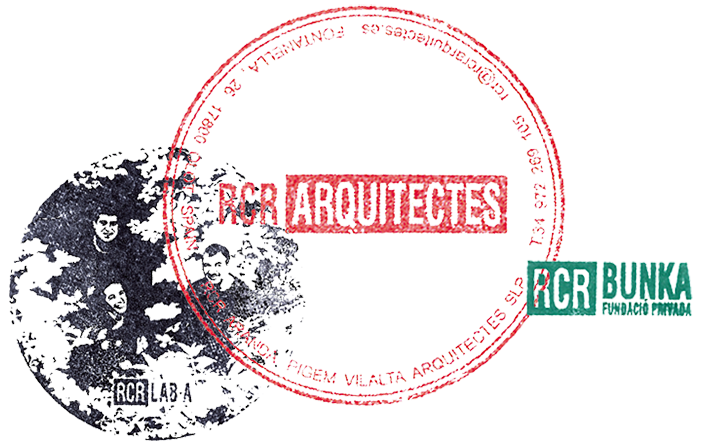 In the summer of 2016 is Fellow in the International Workshop of Architecture and Landscape RCR Architects. Olot + Barcelona + Catalonia. Assistant to the lessons by the Pritzker Award, Architect Eduardo Souto di Moura (Portugal), the Architecture Office Sancho Madrilejos (Spain), the official photographer of Croquis Magazine, Isao Susuki (Japan), the Urban Architect enrich Battle Durany (Spain) and the International Scenographer Alfonso Florez (Spain), among other figures. She developed the practical professional practice in M + GROUP with the Architect Felipe Mesa and in parallel pose, in company with the Architect Luis Callejas for the School The Teaching, her first intervention in Architecture, under mentoring of Architecture Workshop. Invited to write for Croquis Magazine by its Director Fernando Marquez Cecilia is also a Magister candidate in Critical Theory of the 17 Institute of Critical Studies of Mexico D.F. Director for Latin America of the book of Chicago University : OF WHT YOU CAN NOT SPEAK. THE POLITIC ART OF DORIS SALCEDO, written by Mieke Bal and published by National University of Colombia, Medellin Headquarters and Formacol. Curator of the project Madame B, explorations in emotional capitalism. A project from the artists Mieke Bal (Amsterdam) and Michelle Williams Gamaker (London). Eafit University and National University of Colombia. 2014. General Curator for the homage to John Cage. Eafit University, National University and 10 Cultural institutions in Medellin city 2012-2013. She has done history with her program - SOLAR CITY – Bolivarian Radio. Distinguished among the10 Young executives in Colombia in the category of CULTURAL ACHIEVEMENTS; by the Junior Camera in Colombia JCI. In December 2016 is distinguished by Medellin Poblado Council of Culture in the category of “CULTURAL MANAGEMENT”. She was part of the team of Viewers of Photo Spain. She is university professor, columnist and lecturer and also fellow of the Ministry of Culture. Competition finalist of FURS 2002/2003. Best essay about Urban and Regional themes promoted by the Foundation for Urban and Regional Studies that calls the Kent University, Canterbury, England and the Bicocca University of Milano, Italy. She has published in prestigious national and international magazines: Arcadia Magazine, Artery (Bogota), the German magazine Humboldt, magazine of the University of Tolouse, France, and Biennial of La Havana, Cuba. Competition FURS from England and Italy, journals and magazines of local and national circulation. Jury of Curatorial Research Scholarships for the Ministry of Culture in Colombia. Since 2000, she is invited by diverse national and international universities and study groups to present the research “The decapitated memory, forced displacement in Colombia”. A spatial aesthetic and culture analysis about the situation of forced displacement in Colombia. So, she is the speaker about themes of architecture, museography, curator and geopolitics of culture.